Kind of embarrassing, really. Of course, just my wife was there (she wasn't in any better shape), but I don't cry. Not out of some dumb responsibility to "be a man," it just doesn't come very easily to me, I guess. It's so rare, in fact, when the tears started flowing, I think I scared myself! LOL. It's been a melancholy few days, and I haven't been on Twitter since Sunday. If you knew me, you'd know that's way out of character. Not sure why, really, I guess I just feel like I would be capitalizing on what happened, in some way, and it just hasn't felt right. I'll be back at it soon enough, I suppose. I have to say, I'm kinda pissed, brother! We were supposed to meet, you know?! :) Despite my inclination not to meet my heroes, for fear of shattering my image of them, I guess I always felt like I'd bump into you at a kart track, or somewhere "comfortable"—you in your too-tight fire suit and me in my middle-age drag. I'd actually cast off my shyness, for a moment, and share a quick hello. Maybe you seemed more approachable than the others, I'm not really sure. Guys like you aren't supposed to die, you know?! :) You had the kids...and Susie. Plus the comeback! We were SO looking forward to that. I just don't get it, man. It's senseless, really. Of course, you're not the first person with everything going for them to die young, but I really just don't understand it. Guess I should stop struggling and just accept it, huh?! For now, I've been clinging to something Oriol said: "They always take the good ones. The rest, we still have a lot of growing to do." It's something, anyway. Smart man, is the Catalonian! Well, I guess I've said all I need to say. Must be time to say goodbye. 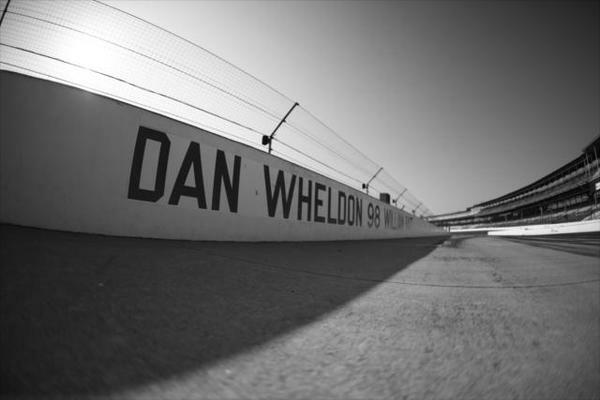 Thanks, Dan, you brought a lot of joy to IndyCar fans and, apparently, you weren't a half-bad human being, either. :) Gotta say, I sure hope you found there is a heaven and you're circulating some kart track up there. After I've done sufficient growing up, I wanna bump into you, sometime. This is really great, JM. The tone, it's so ... different. Phenomenal work. A great letter and a perfect 'until we meet again'. IndyCar's* current modus operandi is 'entertainment' in a Circus Maximus kind of way. Warriors, gladiators fighting it out to the death on an oval at 220 mph in wheel to wheel excitement. But is it a competition of skill or bravery? There is a difference between entertainment and entertaining, but also between entertainment and competition. I want my racing to be entertaining, but I want the entertainment to come from the cold hard battle of competition, not gimmicks, contrived equality, or the bravado of foot to the floor, 100% throttle 100% of the time wheel banging with the prospect of 'The Big Crash'. Note what the ABC announcers said as the crash began. It wasn't "Trouble" or "Oh, no" it was "Here we go" as in "Here we go, we knew it was going to happen and it's what we were all waiting for." Motor racing is dangerous. It doesn't need to be made more so by desperately clinging to a faulty vision. It would be very wrong to compare Dan Wheldon with Ayrton Senna, but that Imola weekend was a watershed moment for Formula 1, where the powers that be took a major step back and looked at many different aspects of the sport. Wheldon's death needs to be the same. It's time for IndyCar* to admit they were wrong and revamp everything. Eliminate mile and a half ovals designed for NASCAR. Go back to the drawing boards for a new car, one that looks good, doesn't launch itself into orbit or fracture spines. Eliminate the contrived excitement of the pack mentality. Give the cars enough horsepower with less downforce so that throttle modulation and driving skill determine who makes it through the corners instead of planting your foot to the floor and praying you don't get caught up in someone else's mistake. Honour Dan Wheldon's memory by doing something difficult, like making major changes, even if it means reducing or eliminating next year's schedule. Taking the easy way out like naming the new car or a trophy after Wheldon will make his death as meaningless as Scott Brayton's, Tony Renna's or Paul Dana's.